Judiciary of Malaysia is largely centralised despite Malaysia's federal constitution, heavily influenced by the English common law and to a lesser extent Islamic law. There are generally two types of trials, criminal and civil. The hierarchy of courts begins from the Magistrates' Court, Sessions Court, High Court, Court of Appeal, and finally, the Federal Court. The jurisdiction of the courts in civil or criminal matters are contained in the Subordinate Courts Act 1948 and the Courts of Judicature Act 1964. Article 121 of the Constitution provides for two High Courts of co-ordinate jurisdiction, the High Court in Malaya, and the High Court in Sabah and Sarawak. Thus this creates two separate local jurisdiction of the courts – for Peninsular Malaysia and for East Malaysia. The highest position in the judiciary of Malaysia is the Chief Justice of the Federal Court of Malaysia (also known as the Chief Justice of Malaysia), followed by the President of the Court of Appeal, the Chief Judge of Malaya, and the Chief Judge of Sabah and Sarawak. The superior courts are the High Court, Court of Appeal, and the Federal Court, while the Magistrates' Courts and the Sessions Courts are classified as subordinate courts. The current President of the Federal Court effective 11 July 2018 is Tan Sri Richard Malanjum, the President of the Court of Appeal is Tan Sri Dato' Sri Ahmad Bin Haji Maarop, and the Chief Judge of Malaya is Tan Sri Zaharah Ibrahim. The current Chief Judge of Sabah and Sarawak is Justice Datuk David Wong Dak Wah. There are three courts with different jurisdiction within what is known as the Superior Court. They are the Federal Court: the highest court in the land, the Appeal Court, the High Court of Malaya and the High Court of Sabah and Sarawak. Each is headed by a federal judge called the Chief Justice of the Federal Court, President of the Appeal Court and Chief Judge of the High Courts of Malaya and Sabah and Sarawak respectively. The Federal Court is the highest court in Malaysia. The Federal Court may hear appeals of civil decisions of the Court of Appeal where the Federal Court grants leave to do so. The Federal Court also hears criminal appeals from the Court of Appeal, but only in respect of matters heard by the High Court in its original jurisdiction (i.e. where the case has not been appealed from the Subordinate Courts). The Court of Appeal generally hears all civil appeals against decisions of the High Courts except where against judgment or orders made by consent. In cases where the claim is less than RM250,000, the judgment or order relates to costs only, and the appeal is against a decision of a judge in chambers on an interpleader summons on undisputed facts, the leave of the Court of Appeal must first be obtained. The Court of Appeal also hears appeals of criminal decisions of the High Court. It is the court of final jurisdiction for cases which began in any subordinate courts. The two High Courts in Malaysia have general supervisory and revisionary jurisdiction over all the Subordinate Courts, and jurisdiction to hear appeals from the Subordinate Courts in civil and criminal matters. The High Courts have unlimited jurisdiction in all criminal matters other than matters involving Islamic law. The High Courts have original jurisdiction in criminal cases punishable by death. Cases are heard by a single judge in the High Court, or by a judicial commissioner. While High Court judges enjoy security of tenure, judicial commissioners are appointed for a term of two years, and do not enjoy similar protection under the Constitution. An application for a judicial review is applied in this court. 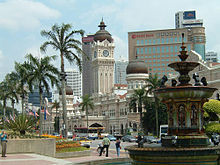 The Magistrates' Courts and Sessions Courts in Malaysia have the power in control the both criminal and civil matters. Somewhat like the former Quarter Sessions in England, but does not exceed RM1,000,000 as per ss 65(1)(b), 73(b), 93(1) of the Subordinate Courts Act 1948 (SCA). The exception however is in matters relating to motor vehicle accidents, landlord and tenant and distress, where the Sessions Courts have unlimited jurisdiction pursuant to s 65(1)(a)SCA. Also, by virtue of s 65(3) SCA, the parties to a legal action may enter into an agreement in writing to grant jurisdiction to the Sessions Court to try an action beyond its prescribed monetary jurisdiction aforesaid. Magistrates are divided into First Class and Second Class Magistrates, the former being legally qualified and having greater powers. Second Class Magistrates are now not normally appointed. The court of a penghulu, or Malay village head, has the power to hear civil matters of which the claim does not exceed RM50, where the parties are of an Asian race and speak and understand the Malay language. The Penghulu Court's criminal jurisdiction is limited to offences of a minor nature charged against a person of Asian race which is specially enumerated in his warrant, which can be punished with a fine not exceeding RM25. In Sabah and Sarawak, there are no Penghulus' Courts, but there are instead Native Courts having jurisdiction on matters of native law and custom. The Court for Children, previously known as the Juvenile Court, hears cases involving minors except cases carrying the death penalty, which are heard in High Courts instead. Cases for children are governed by the Child Act 2001. A child is defined as any person below the age of 18. The Special Court was established in 1993 to hear cases of offences or wrongdoings made by a Ruler. A Ruler includes the Yang di-Pertuan Agong (King), the sultans of monarchical states in Malaysia, the Yang di-Pertua Negeri, and the Yang di-Pertuan Besar, i.e. : the head of states of Malaysia and its component states. Prior to this, a Ruler was immune from any proceedings brought against them in their personal capacity. Faridah Begum bte Abdullah v Ahmad Shah was the first case to be heard in this court. There is a parallel system of state Syariah Courts which has limited jurisdiction over matters of state Islamic (sharia) law. The Syariah Courts have jurisdiction only over matters involving Muslims, and can generally only pass sentences of not more than three years imprisonment, a fine of up to RM5,000, and/or up to six strokes of the cane. The appointment of the Chief Justice is governed by Article 122B of the Constitution of Malaysia whereby the Yang di-Pertuan Agong (King) appoints the Chief Justice on the advice of the Prime Minister of Malaysia after consulting the Conference of Rulers. As for the appointment of the President of the Court of Appeal, the Chief Judge of Malaya, the Chief Judge of Sabah and Sarawak, and other Federal Court judges, similar procedure is taken with the additional requirement of consultation with the Chief Justice. The appointment of Court of Appeal judges is also governed by the same procedures with the additional requirement for the consultation of the President of the Court of Appeal. As for the appointment of High Court judges, similar procedures are prescribed with the additional requirement of consultation with the respective Chief Judges. The appointment of Sessions Court judges is governed by Section 59 of the Subordinate Court Act 1948. They are appointed by the Yang di-Pertuan Agong upon the advice of the respective Chief Judges. Section 78 of the Subordinate Courts Act 1948 provides that the appointment of magistrates are done by the respective state government upon the advice of the respective Chief Judges, except for magistrates in the Federal Territory, where they are appointed by the Yang di-Pertuan Agong upon the advice of the Chief Judge. For a list of Lord Presidents, see Lord President of the Federal Court. ^ "Malaysian criminal court system". Association of Commonwealth Criminal Lawyers. Archived from the original on 15 May 2011. Retrieved 5 January 2011. ^ Constitution of Malaysia:Article 43-2, now amended. ^ "Jurisdiction of the Court". Malaysian Courts. Archived from the original on 14 January 2009. Retrieved 4 August 2008. ^ "Arifin appointed Chief Justice". The Star. Archived from the original on 22 September 2012. Retrieved 11 September 2011. ^ "Md Raus appointed new Chief Justice". The Star. Retrieved 1 April 2017. ^ "Richard Malanjum sworn in as new Chief Justice of Malaysia - Nation | The Star Online". www.thestar.com.my. Retrieved 12 July 2018. This page was last edited on 23 March 2019, at 10:33 (UTC).